…to be clear, I don’t mean an *actual* dime, I simply mean for far less money than the wedding supply stores would have you believe. If you live in a reasonably-sized city centre, have access to a large Dollar store in your area, or are planning on visiting an area which does, I strongly recommend you check out the offerings there before you lay down serious cash at a high-end crafts or wedding store. At one dollar store alone, I saw wedding favour boxes, invitations, cake toppers, boxes of those little bubble blowers for guests, thank you cards, bridal hairpieces, pretty baskets, and a host of other items that, with a little imagination and effort, you can customize to your wedding colours, and personalize so they reflect the style of wedding you want. In this series of posts I intend to discuss some of the things I did for my wedding, as well as some great dollar store wedding decor/favour ideas I’ve seen around the interwebs that I never had time to do myself but were pretty nifty! As the tutorial for each wedding DIY could be lengthy, I will post them separately so none of the posts end up too long! When I finish them all I will leave backlinks to the other posts. In any case, on to the flowers themselves: I used both cotton regular-weight broadcloth in a multitude of colours and some smashing-looking felt too. I finished them with beads, plastic gems, or buttons depending on my whims. The most important thing to have for this craft besides a good, sharp pair of scissors is a glue gun; in my honest opinion, you absolutely can’t do this craft without one. Despite their fiddly nature, these are surprisingly easy to do; you don’t have to be super-accurate, which is nice. As long as you have a reasonably steady hand, don’t mind the tedium of cutting out and shaping each petal individually (or you can buy yourself some fabric petal cutters, but I was going for cheap-to-nearly-free-so-use-what-I-have), and can figure out the quadrants on the face of a watch (3 o’clock, 6 o’clock, etc. 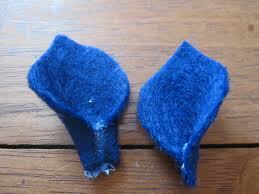 ), then you can make these up in a trice. I did most of mine while plowing through several episodes of Law and Order: CI and CSI: Miami. Aww yeahhhhh…..
An amount of light to medium-weight fabric in your choice of colour and pattern — the sky’s the limit. Best choices are non-ravelling fabrics such as cotton and felt, which hold scissored edges well, but feel free to experiment with different fabrics to see what works best for you. Foam sheets could be cool too! Assemble your supplies. Decide on the amount, colour/s, and relative size of your finished flowers (this is completely subjective and in accordance with your intended use; each of my flowers in the photos are about 3-1/2″ in diameter, so I will give instructions based on those calculations). 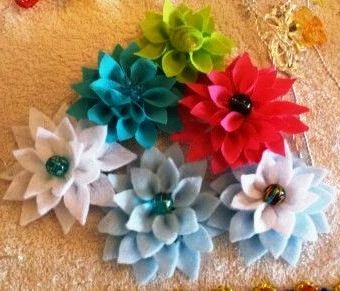 Feel free to customize the petal shape a bit; try some new things! I won’t judge. I got some of my nicest looking designs from altering the petal shapes a bit. 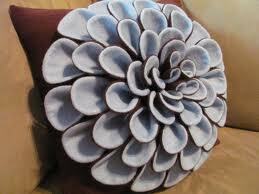 I also only used the largest and smallest petal shapes, and not the middle size. Speaking of petals, you will need at minimum two sizes of petals. I decided on a loose petal dahlia-style, with only 2 layers, though if you make your backing circle large enough you can make a multi-layer dahlia-or-poinsettia-style flower that will “dome” beautifully. Cut out and shape the petals; for a flower like mine, I needed 8 large and 8 small petals; for larger dahlias or multi-layered dahlias you will need more. Make many more than you need; you may find that certain petals fit better together than others anyway. 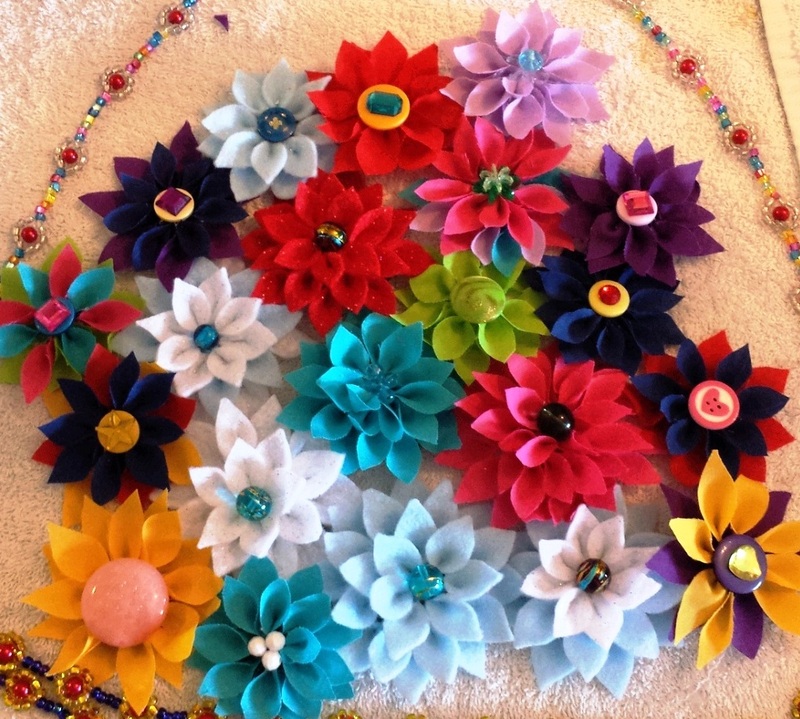 A few minutes before you are finished cutting and shaping your petals, plug in your glue gun and keep it handy; now is the time to bring 3D life to your petals! Holding the petal pointy-end away from you with your thumb and index fingers of your left hand (or if you’re a lefty, the right hand), carefully and SPARINGLY glue a thin line of glue along the bottom of the petal. Immediately pinch closed and hold for a 5-count until the glue cools and sticks. For a different, more “cone” look to the petals, instead of pinching the two raw ends together, fold each bottom end’s corner in towards the centre along the line of glue. For a “ruffled” look, crease the centre bottom then glue the two edges together. 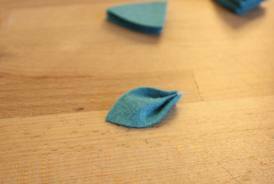 Start attaching the largest petals to your backing circle by placing a small line of glue at the 12 o’clock position on the edge of the petal and 1/4″ inwards; place the petal pointy-end outward vertically along the glue with the petal sticking out at least 1/2″ beyond the backing circle, press down gently until sealed. Repeat this for 6 o’clock, 3 o’clock and 9 o’clock. Now start filling in around the perimeter of the outer circle with the largest petals, symmetrically, until all the spaces are filled. Do not crowd the petals, but don’t leave any gaps either. Repeat the the inner circle, using the next-smaller petals, again using the 12-6-3-9 o’clock method to ensure the flower is symmetrical. IF you are making a larger flower, repeat these steps until you have filled in the entire flower with only a small untouched circle in the middle. Using a gem, button, bead, or other item of your choice, hot glue into the centre of the flower and gently press down until the glue cools. Place the pin attachment on the back of the flower. 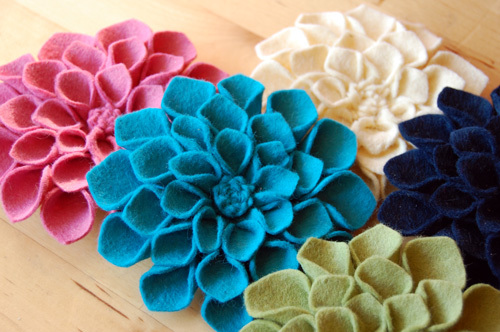 Here are some examples of felt flowers you may want to use as inspiration (with thanks to etsy, craftsy, and various blogs and tutorials I borrowed these beautiful pics from!). 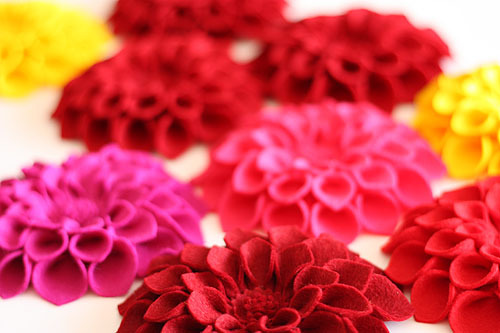 My apologies for showing only the dahlia-style flowers made from felt; when I tried to find more pictures of flowers like I had done, I wasn’t able to find any! 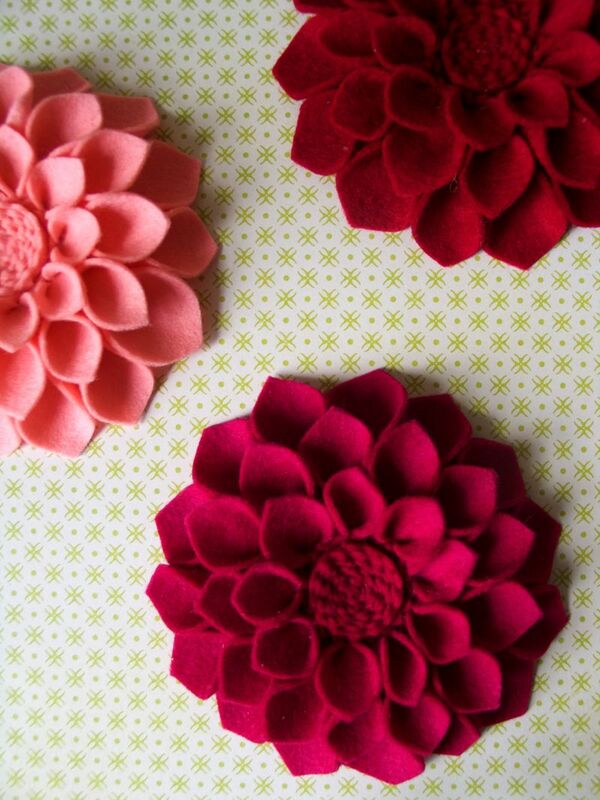 Has nobody else thought of making felt dahlias…NOT out of felt? Not as far as I can figure! 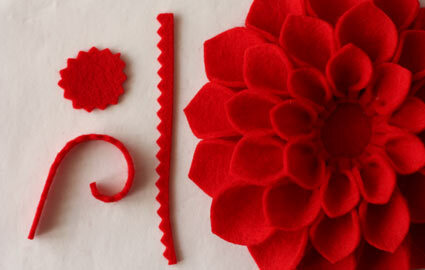 In any case, so endeth my first long-winded tutorial on how to make fabric dahlia-or poinsettia style flowers. Good luck, and let me know if you have found this tutorial useful! Previous Post Welcome to my brain droppings! Next Post I am the ditziest bride-to-be ever.